Spending on Medicaid is projected to hit $460.5 billion, according to a new report by the National Association of State Budget Officers. Bigger than Greece’s economy, bigger than Walmart’s revenue, Medicaid’s program is growing and second only to traditional employer enrollment, noted a report from the US House of Representatives’ Committee on Oversight and Government Reform in April 2012. Entitled, Uncovering Waste, Fraud, and Abuse in the Medicaid Program, it stated, “The [Medicaid] program has grown so large and so complex… that it is highly vulnerable to waste, fraud, and abuse. No one knows how much of Medicaid’s budget consists of [it].” The answer has always laid in the volumes of data Medicaid claims create. In such a vast sea, uncovering Medicaid fraud is difficult—especially if you don’t have the right sight lines. Ironically, it might be that very sea of data that helps resolve the struggle both federal and state agencies have in identifying fraud. Access to more data, not less, is key. At about the same time that report was issued in Washington, the TechAmerica Foundation issued one that explained the situation well. It stated that the feat of identifying improper payments was done by selecting a small sample of claims, requesting medical documentation from the provider, and manually reviewing the claim to verify compliance. It was difficult to see patterns and it was time-consuming activity. There was a better way to analyze the data and ultimately change the course of fraud. TechAmerica urged the government to start looking at ways to capitalize on the volume of data and use it to their advantage. LogistiCare requires its providers to document every single ride, not just a sampling as most brokers do. Why? The volume of data allows patterns and trends to be more easily identified and substantiated. 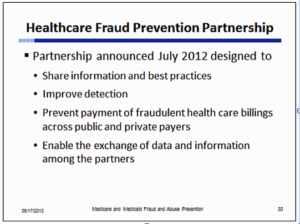 If we improve the efficiency, ease and speed in catching Medicaid fraud, we reduce the desire to break the system. It’s the good documentation work of all the honest transportation providers that helps snip out the few dishonest ones. Exactly why we do it. In an article by the Milwaukee Journal Sentinel on Medicaid fraud, “Claire Smith, a spokeswoman for the state Department of Health Services in Wisconsin added that one of the reasons that the state chose a transportation broker for its nonemergency medical transportation…was that brokers have reduced waste, fraud and abuse in Medicaid programs in other states.” It’s a sentiment that is well documented. LAO, The California Legislature’s Nonpartisan Fiscal and Policy Advisor, likewise reported, “Reasons cited by states for switching to broker models include improved NEMT cost management, improved access to NEMT services, and reduction of NEMT fraud and abuse.” Documentation of trips plays a big role in reducing fraud. If the trip time doesn’t match up with the provider services, something is amiss. However, the key to busting more fraud isn’t just in documentation and the technology around data analysis. Sharing information also aids in the effort. Just three months after the House of Representatives report issued their report, the Obama administration created the National Fraud Protection Partnership, which helped open up the view on data between the private and public sectors. Great strides have been made in the fight against Medicaid fraud. Complete collection of data, accurate reporting, predictive modeling and verification strategies all play a role in fraud prevention. While there is no silver bullet, data intelligence technology is changing the game. It’s not as easy for the crime to go unnoticed and that makes all the difference.